Indexed in: Scopus, Chemical Abstracts, EMBASE, EBSCO. Infections caused by viruses, bacteria, fungi and parasites are enduring threats to human well-being and survival. The discovery of antibiotics in 1928 had given the hope of controlling infectious diseases to human, livestocks and plants. However, wide spread and rapid emergence of multidrug resistance (MDR) in viruses and microorganisms, as well as their vectors, has posed a major challenge to the healthcare sector, creating a fear of return of the pre-antibiotic period. The emergence of MDR microorganisms and lack of effective antibiotics against them has direct impact on every sector of healthcare, including success of surgical interventions, post-surgical survival, neonatal and elderly care, etc. Unfortunately major pharmaceutical conglomerates have either closed down or downsized their anti-infectious drug discovery programs. Similarly, the number of academic researchers working on the anti-infectives agents has also reduced over he years. Ironically our understanding of infection in general, and spontaneous and acquired resistance in pathogens in particular at genetic and molecular levels, has improved substantially during the same period. 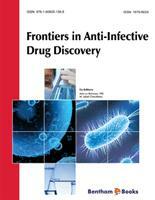 The volume entitled “Frontiers in Anti-Infective Drug Discovery” is our effort to highlight the continuous importance of research in this field. The volume contains five excellent articles by leading researchers in the field. These articles not only cover discoveries of anti-infective agents of natural and synthetic origins, but also review scientific work on the identification of molecular targets for new anti-infectious agents. The article contributed by Novio et al reviews the literature on antiviral properties of marine natural products, mainly from algal sources. The viruses targeted include HIV, herpes simplex, influenza and cytomegalovirus viruses. Peptides have been known to possess a variety of biological activities, including antibacterial and cytotoxic properties. Hick and Clark have contributed a comprehensive review on the activity of synthetic peptides against the multidrug resistance bacteria and fungi, known to cause a variety of infections. Physicochemical properties concerning of peptide-cell wall lipid interactions of therapeutically important peptides, their mechanisms of action, as well as methods to overcome the problems associated with the therapeutic use natural and synthetic peptides (metabolic stability, lack of selectivity and stability, etc.) are also discussed. Chopra et al in their review focus on the diverse scaffolds of natural products and their anti-infective properties. These natural inhibitors provide excellent leads for further development. The advent of enabling technologies for the dereplication, isolation and structure determination of natural products, as well as the development of new biological screening methods, have further accelerated the process of discovery of new anti-infective agents from natural sources. The understanding the multidrug resistance the mechanisms molecular level is the key to modern drug discovery and development against pathogenic agents. Salem and Zuel-Fakkar have reviewed the recent developments in the fields of molecular and structural biology and molecular genetics, related to intrinsic and acquired resistance in microorganisms, against available drugs. These complex molecular processes help us to understand the mechanisms of inhibition and to identify the targets for development of the next generations of antibiotics and MDR reversal agents. Last but not least, Maderia and Phillips have reviewed the recent scientific work on the prevention and treatment of malaria through anti-malarial chemotherapies. Malaria being the major killer of human race, particularly in developing countries, remains a gigantic healthcare challenge for national governments and for pharmaceutical and biomedical R&D scientists. The development of new leads for malarial prevention and treatment is focused in this review. We are confident that these contributions by experienced researchers will not only help the readers in developing a better understanding of the science behind anti-infection drug discovery and development, but most importantly will highlight the importance of systematic and sustainable efforts in this area. We are grateful to all the contributors for their diligent efforts in reviewing the recent literature on various aspects of the field in comprehensive and timely manner. We also acknowledge the efforts and hard work of the editorial team, particularly Mr. Mahmood Alam (Director Publication) and Miss. Hira Aftab (Assistant Manager) of Bentham Science Publishers.